PHICUS at Soda Acústic Barcelona, 1-8-2018. PHICUS: Ferràn Fages, guitar, Àlex Reviriego, double bass, Vasco Trilla, drums, at Soda Acústic, Barcelona, 1-8-2018. Nocturna Discordia #178 Triple Discordia! First set. From the vaults. Discordian archeology. Could be the first Discordian night I attended. Recovering great stuff. 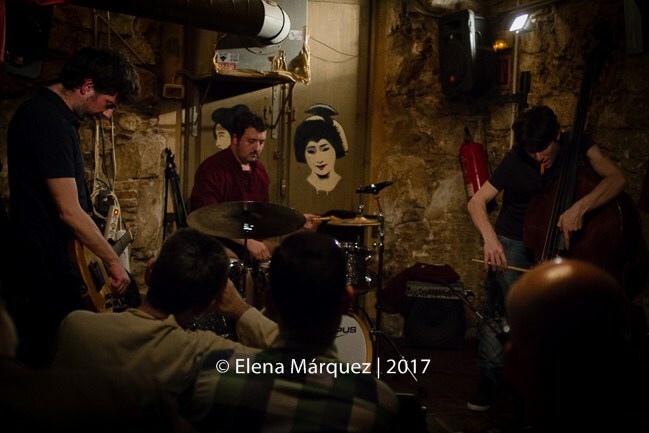 Alguns Homes Bons is among the best avantgarde jazz bands you can listen to in the burstling Barcelona scene. Unfortunately they don’t play too often, ’cause all of them are great musicians with their own career and other bands and projects. So you better don’t miss any opportunity to see them on stage. They’re just amazing. Phicus return to Robadors 23, this time accompanied by Joachim Badenhorst on reeds. Last time, I burbled on about “matching and contrasting tones and textures… layered and discarded in an unstoppable kineticism,” and yes, I’ll stand by those words. Phicus are carving out their own intense brand of precision disorder. Passages of glorious frenzy alternate with more meditative minimalism, and throughout there’s a constant energy, a seething potential being tapped and channelled. Read the complete review at the author’s blog.